Vogue has released their latest collection of patters for Spring 2014. Overall it seems like the designer patterns are really sleek and modern, where as all the Very Easy Vogues are poofy voluminous shirts. As much as I appreciate a lot of the patterns in this collection, I don’t know how many of them I will actually be buying – it just doesn’t feel like very many of these are a style I would wear. But there are a few I can totally see on others in the blog-o-sphere, and I am really liking the men’s patterns this time around, so I am going to say that there are at least a few highlights in this collection. V1381 – A Ralph Rucci design. A bit difficult to see all the lovely top stitching details in the photo. I think this is a really lovely dress, I love the design, and the detail. I just don’t think I would wear it, so I will admire from afar. V1384 – A Donna Karen design. I really like the simple elegance of this dress, but, again, maybe not something I would wear. V1389 – Another Donna Karen. The jacket is ok, and the top has a lovely wide collar band detail. But all the fun details are on the back of the skirt! Which is covered by the jacket. into something that will be hidden a lot of the time. V1388 – An Anne Klein design. It looks really interesting in the line drawing though! V1382 – Another Anne Klein. Looks like color blocking is still a trend. And I have seen a lot of those hidden pockets popping up too. I actually sort of like this dress, but not for me. V1386 – A Today’s Fit pattern. version of the ubiquitous V1250 pattern. Not sure if I like the relaxed fit though – perhaps a bit baggy for my taste. 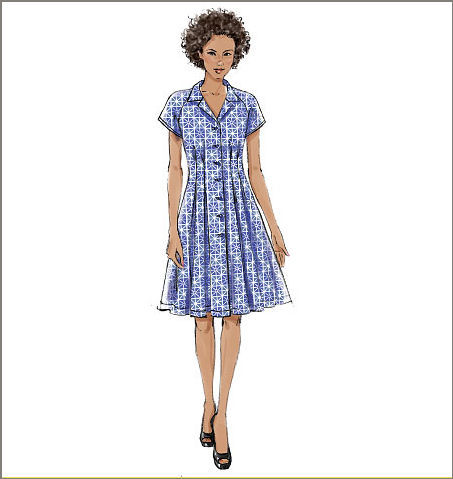 V8975 – A Marcy Tilton pattern. but I can appreciate the interesting seaming and fabric manipulation. 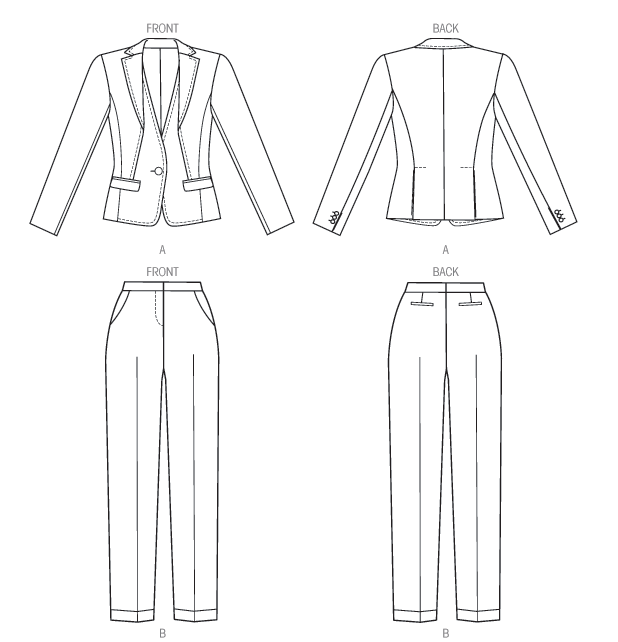 V8982 – A Marcy Tilton jacket pattern. I actually really like the collar on this jacket. 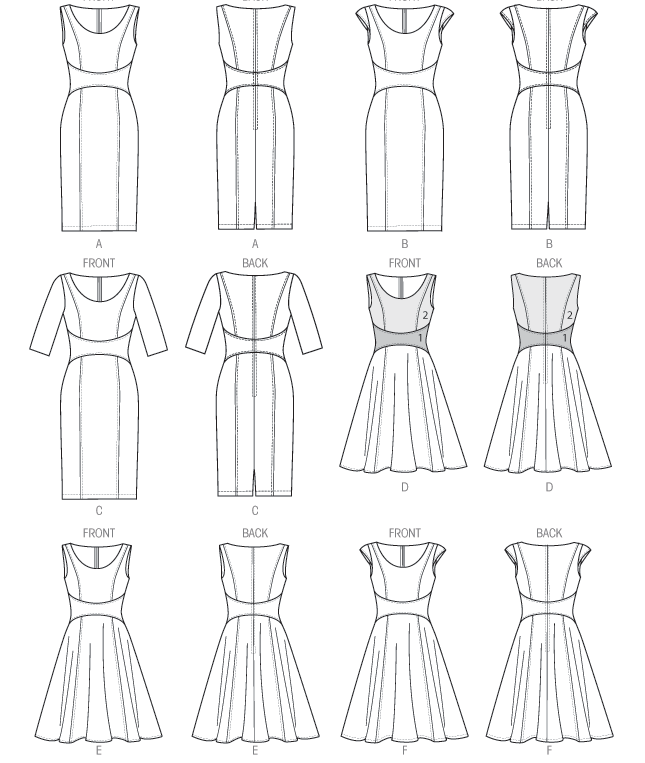 V1380 – A Pamella Roland dress. V1379 – This Tracy Reese dress makes me want to break out in song. 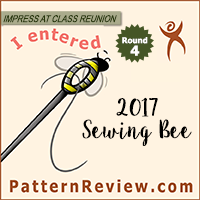 V8973 – I am in love with this Vintage Vogue pattern! The pleating on the top is lovely. (it has open back with crossed straps), but the jacket makes it much more elegant looking. V8972 – An Easy Options dress with cup sizes. I like it, but it very similar to older Easy Options styles. V1387 – A Rebecca Taylor top. I actually really love this. The delicate gathers are just so pretty! There is also a short sleeved version included that I like as well. pattern from that category this time around. Simple, but fine. V1383 – A DKNY pattern. Usually DKNY is more tasteful. Or sophisticated. Or something. This dress sort of looks like it got dragged to a sweet sixteen party. V1385 – A Today’s Fit pattern. The collar ruffle was sort of interesting at first, but then with the dots I got a clown vibe and I just can’t shake that from my brain. version with the high-low hem and huge bow just aren’t doing it for me. It looks like the skirt is short because you ran out of fabric. But without the bow you would have had enough! V8984 – I’m just going to point out that most of the Very Easy Vogue pattern look like this. I didn’t bother posting most of them, and now you know why. 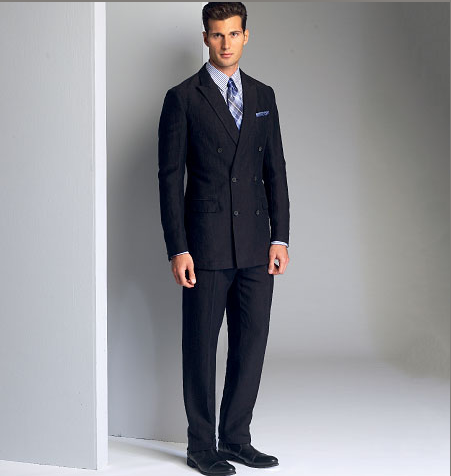 I thought the men’s pattern were pretty snazzy this time around though – check out this suit! and regular and skinny legged trouser. Might have to add to my tuxedo stash! 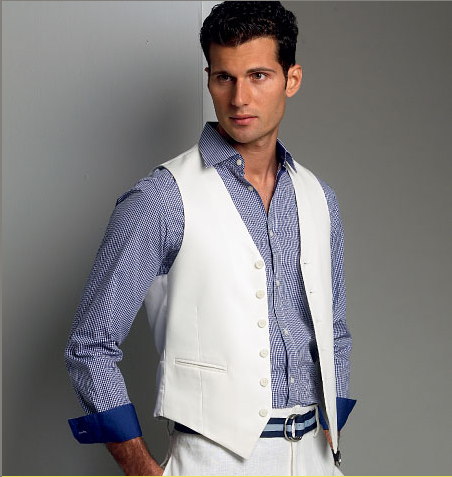 V8987 – I also think this vest pattern is really sharp. Do men still wear vests? They should… It looks so classy. It totally needs to come back and be a thing. 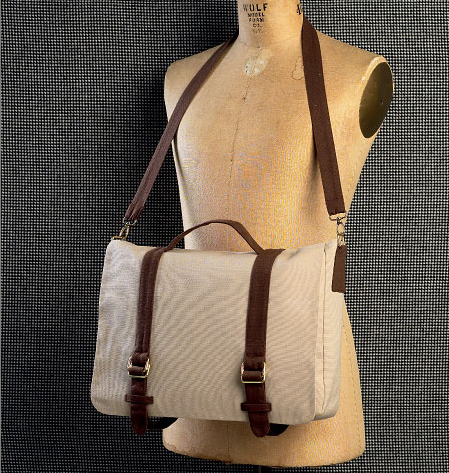 V8990 – I actually really like this classic messenger bag pattern too! I would love to get some heavy Spoonflower canvas and make some geeky bags. Well, actually, I want to get some geeky fabric and make other things too. Aww, heck, I’ll admit it – I just want to dress like Mrs. Frizzle. And there we have it – the Vogue springs have sprung. Or something like that. I feel like many of these pattern had lovely subtle details that I appreciated, but that there weren’t a lot of silhouettes I was really drawn to. Tell me – what do you all think? See anything that catches your eye? Or are the details too quiet and boring? Are we excited about where the patterns are going this spring? 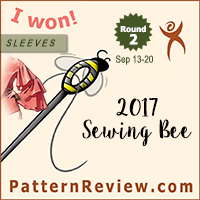 Or do we want to stick with winter sewing? Feel free to discuss in the comments! Overall a great release. Yeah there are some duds (V8984 I am talking to you WTF??) but the menswear patterns and V1381, V1384, V1389, V8962 and others more than make up for the crap. I am very excited by this collection. Spring is normally a disappointing collection for me but I'm so pleased Ralph Rucci is back that I can't really evaluate the rest of this one yet! I love the details on the Ralph Rucci. I might buy it just to see how it's done. I don't like high/low hems so I ignore them and make them the length I prefer.